MaxiCharge streamlines payment processing in your office by automatically entering your POS (Point of Sale) payment information directly into Maxident and eliminating payment balancing activities. MaxiDent has partnered with Chase Paymentech to develop a fully integrated payment processing module to streamline payment processing in your office. MaxiCharge simplifies payment processing to make day-to-day activities more efficient and balancing activities a thing of the past! MaxiCharge reduces your merchant costs, instantly increases your profitability, and eliminates the need to double enter payments! Eliminates the need to manually enter payment information into Maxident. Saves times and eliminates the opportunity for human error. Assures that your payments always balance, automatically. Simply insert the chipped card into the merchant machine. Maxident will identify what type of card it is, (VISA, MasterCard, Interac) automatically. Once the transaction is approved, the approval number is printed on the Maxident receipt. Your day-end and month-end bank deposit will balance automatically. No more payment entries in your POS system, then into Maxident. 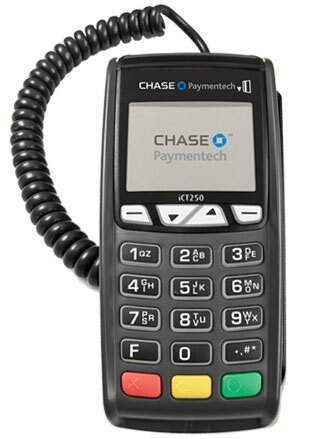 100% PCI-Compliance and increased security. Dedicated Chase Paymentech Business Relations Manager. Guaranteed to provide you with rate comparisons on demand.